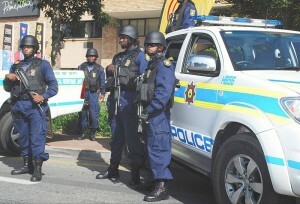 A very able SAPS making us proud in 2010. Photo courtesy of ER24 EMS (Pty) Ltd. Given the extraordinarily high rate of crime in South Africa, the notion of police accountability is crucial for the effective handling of crime prevention, criminal justice, and community relations. In a concise nutshell, police accountability asserts that as an agency tasked with serving the ends of social peace and personal security (as well as the security of property), the police force should be an example of lawful conduct. This in turn means that as representatives of the national criminal justice system, members of the police force are subject to the same laws they are employed to uphold. Central causes underpinning inefficiency, corruption and negligence are quite well understood, but, unfortunately, extend well beyond the narrow confines of the police force into the spheres of socio-economics and culture. It is thus that society as a whole is tasked with the duty of helping the police to uproot unwanted practices and punish erring individuals. It hardly comes as a surprise that, tragically, one of the main causes of corruption is financial pressure: many of those who enter into policing are not adequately compensated, and the latter pressure often results in the proliferation of corrupt practices. This is not to say that the South African Police Service does not employ individuals who are outstanding in their personal and professional conduct, and, all too often, those that are doing exemplary work are often unappreciated by the public at large. The trick, it would seem, in furthering the cause of police accountability is to balance legitimate cause for concern with the public recognition of good police work. It is only in this two-way relationship that many of the problems that currently plague SAPS can be effectively addressed. It should also be noted that police accountability is not a witch hunt, a means to alienate the police force from the public it serves; instead, it should be seen as the public at large engaging in their own social existence by censuring unlawful acts committed by police men and women who are abusing their authority and taking advantage of the community. Unlawful acts committed by members of the police force include bribery, generally corrupt practices, collusion with criminal elements, extortion, torture, excessive use of force, assault and even (in the worst cases) outright murder. This is not a complete list, and it does not mention incompetency and ineptitude. In defence of our police men and women as to these latter two charges, though, the public should also remember that they work under enormously strained conditions as they are underfunded, under staffed, and as mentioned earlier, under paid. Although representatives of the law should have little excuse for unscrupulous behaviour, for the eradication of unlawfulness to take effect, there are legitimate police grievances that must be addressed in the process. The message of this site is simple: report police who, in your own estimate, are breaking the law. You can do this in person or you can contact an authority anonymously through channels like the Crime Stop telephone number.